If you still have any doubts that Sony will be launching a new Xperia lineup of smartphones, then the following news might convince you that the Japanese company will indeed reveal the Xperia Z5 family very soon. Sony has already confirmed that its press conference during IFA 2015 trade fair will take place on September 2, which means we're only a few hours away from the announcements. A new poster showcased at Sony's booth at IFA 2015 proves that the company is readying three new Android smartphones: Xperia Z5, Xperia Z5 Compact and Xperia Z5 Premium. All three handsets will be officially unveiled later today, but they probably won't be available for purchase until later this month or perhaps early October. 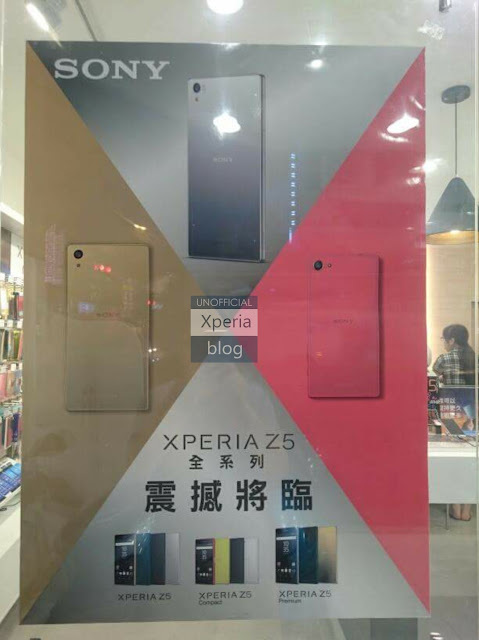 In addition to the existence of the Xperia Z5 family, the poster also confirms which colors will be available for these smartphones. As XperiaBlog points out, Sony Xperia Z5 will be available in Gold, Teal, Black and White, while the Xperia Z5 Compact will be available in Pink, Yellow, Black and White. Last but not least, the most expensive of the three, Sony Xperia Z5 Premium, will only be available in Chrome, Black and Gold color options. We have already reported to you about the possible hardware configuration of these upcoming smartphones, so the only thing that remains is for Sony to confirm them.